This new year, resolve to try quartz in your kitchen! Quartz has been gaining in popularity lately and for good reason. With a very pleasing aesthetic appeal and it’s durability, quartz has a variety of benefits for any homeowner looking to remodel their bathroom or kitchen. Basically, quartz is a type of material that is a natural product. However, it is made in a facility using polymers and becomes compressed and then glued together to create the slabs we see in bathrooms and kitchens. Because quartz is made in a facility, manufacturers are able to control the color and pattern of the quartz that they produce. Quartz is a highly dense material which is why it has become such a popular material as of late. Because it is processed in a facility, quartz is able to withstand almost anything. The process of manufacturing quartz assures that it becomes such an impenetrable surface that staining is simply not an issue. That is precisely why a lot of people are turning to quartz for use in their kitchens as the material for their countertops. Quartz can stand up to tough condiments that oftentimes would leave a stain like ketchup, wine, and coffee. Quartz is known to be a contemporary style that fits with many kitchen designs. Most homeowners that desire a contemporary feel within their homes would be greatly attracted to the aesthetic of quartz in either their kitchen, bathroom, or both. With all the benefits that come from quartz, you may be wondering, “why doesn’t everyone have quartz all over their homes?”. The one drawback is the price of quartz. Since it is such a hot commodity and a manufactured material, it is quite expensive. Another drawback to quartz is its inability to handle very hot surfaces. This means that hot pots and pans in the kitchen should not be placed directly on quartz and that any hot tools used for hair in the bathroom should avoid direct contact with quartz. 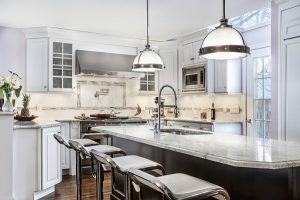 Some homeowners can look past the heat issue, while others who may cook every day with hot pots and pans or straighten their hair daily may opt to use a more natural material that can handle the hot elements instead of quartz. This entry was posted on Friday, January 27th, 2017 at 11:33 am. Both comments and pings are currently closed.